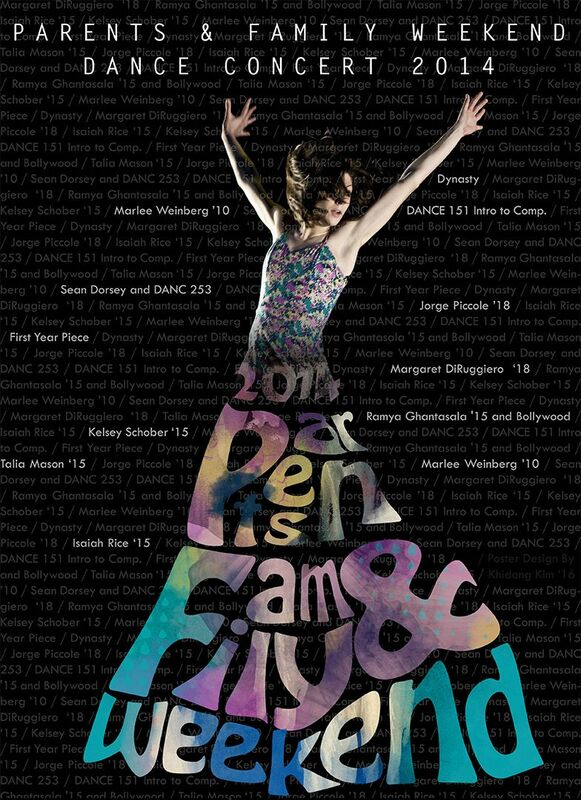 Bates dance poster for 2014 Parents & Family Weekend Dance Concert 2014. From that perspective, posters created by Khi Kim ’16 of Goyang, South Korea, have fueled larcenous passions while helping to fill Bates venues over the last four years. In 2012, Kim arrived at Bates to study biochemistry. He also had a graphic design background, and soon got a campus job designing posters for Bates theater and dance productions. In the four years since then, Kim has created some of the best and best-liked posters that the campus has ever seen. “His work is sophisticated, evocative, and clever,” says Tammy Caron, senior designer and Kim’s supervisor in the Communications Office. 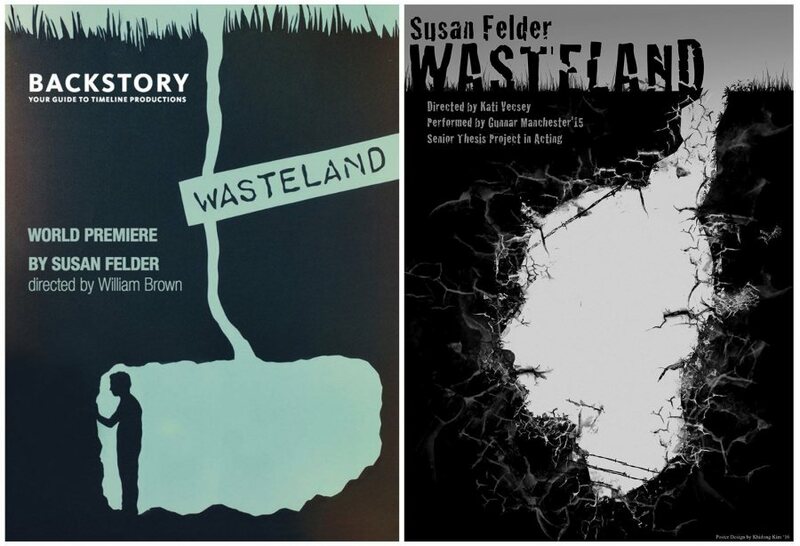 Here are two versions of a theater poster for Susan Felder’s play Wasteland. At left is one done by a Chicago-based theater company. At right is Khi Kim’s version for the Bates production in fall 2014. Khi Kim’s poster for Wasteland does what a poster should, says Katalin Vecsey, senior lecturer in the theater program who directed the fall 2014 production of the Susan Felder play. As with her other poster project with Kim, Vecsey first asked him to read the play. Then, he reviewed the set design with Vecsey while they talked about her directorial and artistic concept. She also showed him a Wasteland poster, on left above, that she did not care for. The result, Vecsey says, was one of his best Bates posters ever. “By the way, Susan Felder also loved it,” she adds. And if Kim knows what students like, it’s because he works at it; he’s always in conversation with his campus and his fellow students. He calls it getting “inspiration from real life.” All day, he says, “I have conversations” with people around him, all the while thinking about design concepts. 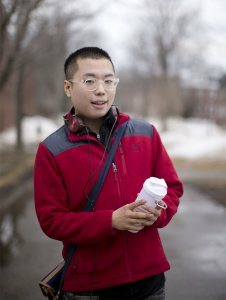 Born in Korea, Kim was educated in China before coming to Bates. Upon arrival, he decided to trim his dual interests in science and art down to just one. “I thought, ‘OK, now’s the time.’” Yet, four years later, “I’m still doing both,” he says, and it’s been a win-win. For example, his senior thesis on RNA has drawn him into bioinformatics, a field that develops methods and tools to understand biological data. Bioinformatics puts a premium on visualizing information, and that’s exactly what Kim has been training to do while designing posters. He does it with an “intuitive understanding of the concept-to-execution process,” says Caron. Kim, known for his indefatigable charm, might hear from several Bates artists involved in publicizing a performance. It’s a rigorous process; Professor of Dance Carol Dilley loves Kim’s work but admits that her team “might reject one out of every three” of his initial concepts for a dance concert poster. Each time, Dilley says, Kim comes back with either a revision that accurately reflects the client’s feedback or with a completely new concept, whichever was requested. It helps that Kim has command of a robust set of skills, from manipulating images, layers, and type to using line, composition, and scale play. He plays with various design elements to create both complex designs — such as the poster for They Fly Through the Air With the Greatest of Ease — and, says Caron, “incredibly powerful, yet simple statements,” such as the Boxing 2000 poster. This story appeared in the the Spring 2016 issue of Bates Magazine.